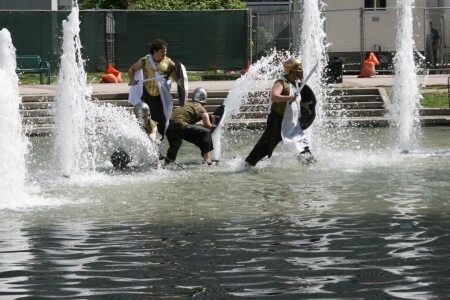 The sound of a trumpet takes an unsuspecting audience from behind, as they are called to run toward the action, initiating in the water of a large and functioning outdoor fountain. And thus stage is set for the Urban Bard’s production of one of William Shakespeare’s lesser-known works, Two Noble Kinsmen, co-written with John Fletcher. 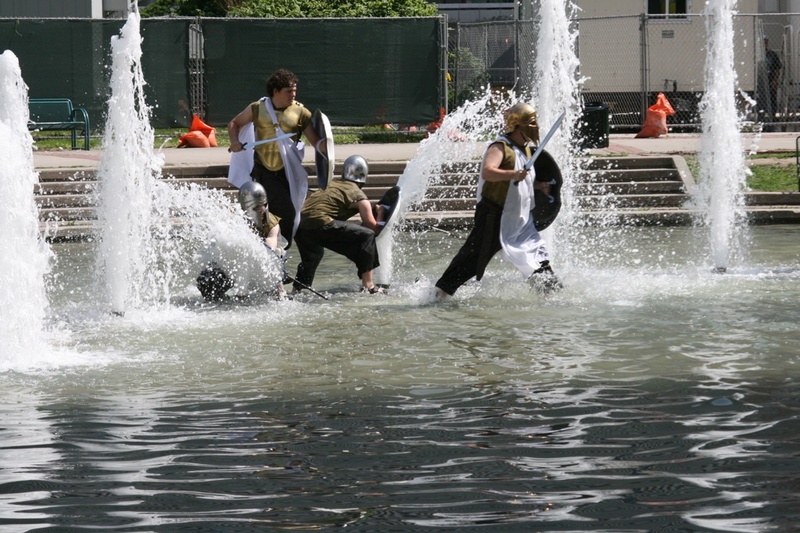 The action continues as actors run toward us through the pool. Two men are taken prisoner by jailers who lead them to their clink atop a gated structure that stands amidst the urban landscape in Toronto’s beloved College Park. The relatively new theatre company has taken it upon itself to re-imagine classic Shakespearean works and integrate them into prominent Toronto landmarks and cityscapes, offering spectators a thoroughly immersive and interactive viewing experience. The task is no small feat. Aside from the technical challenges of the nature of these presentations, these are not the most accessible texts to work with. But it seems that these two obstacles cancel out one another. The redistribution of the stage’s surface around us common folk generates such a freshness that bystanders are held transfixed. People passing by join the pay-what-you-can audience in following the actors around. The manifestation of the two kinsmen’s plight soon emerges from a nearby garden in the form of Princess Emilia (Tammy Everett), complete with heaving bosom. The prisoners Àrcite (Erick Fournier) and Palamon (Christopher Sironi) are immediately swept away in love, and their contest for her hand culminates in a public joust. Through humourous bickering and testosterone-fueled competitiveness, theirs is indeed a story of kinship, they try to maintain their nobility while essentially trying to kill one another. This tragicomedy is set off by a fun though fruitless subplot that lent itself well to the urban-park setting. The jailor’s daughter (a fiery-eyed Adrianna Prosser) is herself taken by Palomon, freeing him and setting the kinsmen’s plot in motion. However she manages to lose her mind while imagining her future with Palomon, prancing and rolling about with leaves in her hair, popping up at just the wrong times and standing among audience members delivering her nonsense monologues with intensity and frivolity at the very same time. With dedicated direction and performers, this production brings the time and place of the text’s origin to mind: a time when theatres were often outdoors, and lit only by the power of nature. I appreciated the simplicity of the staging which was successful despite apparently overwhelming obstacles. I was also impressed by the focus of the action during certain moments of solemnity. In one very well executed scene, one protagonist after another invokes specific Gods who are frozen as if statues in this square. But there was also a well-balanced lightness to the direction: I appreciated the decision to use real food when they are meant to be eating. This was the sort of thing that gave a true earthy quality to the performances that isn’t often enough seen in professional theatre. This ambitious collective gave a very delightful and surprising performance of an otherwise average play by the great master. For me and my companion it wasn’t the best material to be working with, but that’s for me to take up with Will S. It is with sincere excitement that I await their Richard III coming this fall. I look forward to seeing how Urban Bard brings that insane man to the streets and pedestrians of our little city. The Two Noble Kinsmen played its final performance in College Park on Sunday, June 20.